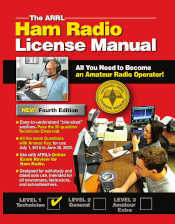 This site requires a separate account from the primary ARRL website. You do not need to be an ARRL member nor have an ARRL website account to use this site. Sign Up to create an Exam Review account — Enter email address and password. If you have an ARRL website account you may use the same email and password but a separate Exam Review account is required. Respond to confirming Email — Click the link in the email to activate your account (check spam folder as well). This account activation is required before you will be able to login. Login to Exam Review — Click the Login button at upper left and then on the Login page enter your account email and password and click the Login button.